The Middle East high-density polyethylene (HDPE) market is expected to grow at a healthy rate during the forecast period (2018 - 2023). 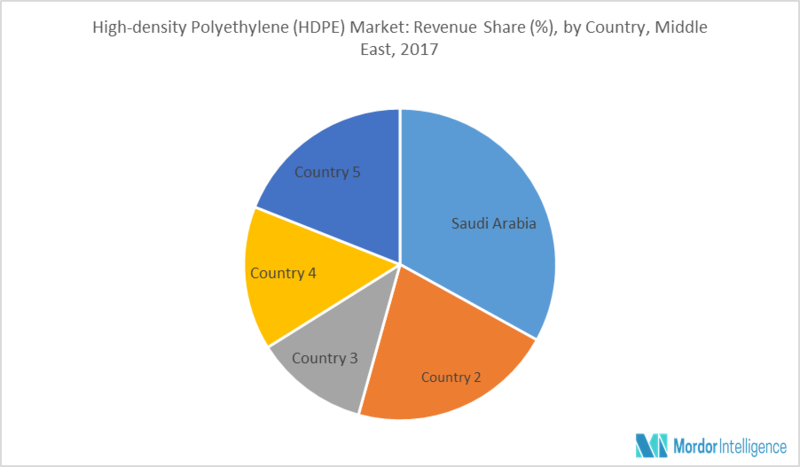 The major factors driving the growth of the HDPE market in the Middle East region are the increasing use of plastic pipes as substituents and the increasing applications of HDPE in the packaging sector. Owing to their unique performance advantages over other materials, such as moderate cost, ease of handling & installation, long service life, and corrosion resistance, the demand for plastics in small and medium diameter pipes is increasing at a significant rate. The rebounding building construction expenditures in Qatar, the UAE, and Kuwait are further expected to increase the demand for plastic pipes, which are used as a conduit for gas distribution, drain, waste, and vent pipes. HDPE, accounting for the second-largest share of plastic pipe demand, is expected to witness the strongest gains in demand until 2023. HDPE pipes are anticipated to register an increasing use in sewer & drainage, potable water, and natural gas distribution applications, thereby, they are anticipated to occupy the current market share of other materials used in these applications, such as steel and concrete. HDPE is employed in the packaging industry for a wide range of products. Blow molded HDPE products are majorly used in the packaging industry and are often seen in several applications, such as household as well as industrial containers and bottles. This can be majorly attributed to the properties of HDPE, such as stiffness and environmental stress crack resistance. Un-pigmented HDPE bottles are also used for packaging products that generally have a short shelf life, such as milk and juices. The other major use of HDPE in the packaging sector includes the packaging of chemicals, such as detergents and bleach. The Saudi Arabian government has initiated an industrial clustering program to focus investments and growth in minerals & metals, automotive, plastics & packaging, home appliances, and solar energy. Apart from the pre-established demand for HDPE in these sectors, the growth in infrastructure, primarily in the middle-east countries, and the possible industrial expansion owing to the government initiatives have led to an increment in the demand for HDPE. Owing to the recent technological advancements in the polymer industry, the specialty film industry has acquired significance because of their advanced as well as beneficial physical and chemical properties. Saudi Arabia is expected to continue its growth and is expected to expand its chemicals industry in the future, majorly in commodity chemicals and polymers made from low-cost oil and gas-derived feedstock. The rising investments in the healthcare and infrastructure industries in the country are expected to propel the growth of the HDPE market in the coming years. September 2017: Amir Kabir Petrochemical Company (AKPC) to export 5,000-8,000 mt/month of polyethylene to South-East Asian countries in 2018, with Vietnam being the major target. Major Players: Saudi Polymers Company, Saudi Yanbu Petrochemical Co., Saudi Ethylene and Polyethylene Co. (SEPC), Saudi Kayan Petrochemical Co., Jam Petrochemical Co., and Amir Kabir Petrochemical Co. (AKPC), among others. 8.10 Saudi Yanbu Petrochemical Co.
8.12 Saudi Kayan Petrochemical Co.
8.13 Sharq - Eastern Petrochemical Co.